Welcome to Wild Horse Creek Farms, we appreciate your interest. The origination of Wild Horse Creek Farms really started 42 years ago in 1972 when on a snowy Christmas morning Hike and Alma Rayburn gave a very special gift to their grandson, Craig Bidner, when he was only 5 years old. That gift was not one you can unwrap, but it was even better, one you could ride -- a Shetland pony name Holly. Holly and Craig became fast friends and shortly thereafter Holly had a beautiful colt that Craig named Sparky. The bond Craig created with Holly and Sparky forever created a lasting and meaningful love of horses, animals, land, and agriculture. Below is a picture of Craig leading Holly hitched to a cart preparing for the Danvers, Illinois 1976 Bicentennial Parade. Also, pictured (in the red cowboy hat) is friend Mark Risser and Craig's Father Gordon Bidner (red cap). By the time Craig turned 8, he became interested in raising and showing swine and elected to raise the breed Yorkshire. He stared out with one sow that he named Mandy who had a beautiful litter of piglets. Unfortunately, that winter she caught pneumonia and died, a hard lesson to learn about life and all living things to be sure. The litter however survived and this one litter turned into 40 litters a year by the time Craig "retired" from raising hogs after a 10 year stint in 4-H that resulted in many highlights including: National Club Congress Award Winner, Grand Champion Yorkshire Barrow at the Illinois State Fair, State Federation Leader, McLean County 4-H Council President, President of the Danvers Industrial Youth 4-H Club, I Dare You Award Winner, McLean County Student of the Year, and Gene Mossberger Youth Award. Below is a picture of Craig showing a Yorkshire gilt at the Fisher Fair in Fisher, Illinois in 1976. Craig attended the University of Illinois and for the first time in his life did not have responsibilities for any animals minus his Doberman Pinscher named Zeus who still lived on the farm back home. Picture of Zeus below. Craig dived into studies and fun while attending Illinois and graduated with honors with a degree in Journalism. Craig was very involved on campus including: President of Star and Crescent (Sophomore Honorary), President of Ma-Wan-Da (Senior Honorary), Orange Crush (Athletic Booster Club), finalist for Chief Illiniwek, Member of the Student Alumni Association, Top 100 Seniors, active member of Farm House Fraternity, Fraternity All-Star Basketball Team, and member of the Senior Homecoming Court. Craig accepted a position with the Hospitex Division of Baxter Healthcare upon his graduation in 1989 and began a career in sales assuming the life he had known connected to agriculture was in the past. In 1993 Craig's life was about to change in two significant ways, first he married Joy Elizabeth Edwards and together they purchased Nikco Sports (3 months after they were married). Nikco Sports is a national sports marketing company based in Chesterfield, Missouri and focuses on retail distribution, web related sales (www.nikcosports.com), servicing and selling to past and future individual and corporate clients, and a promotional advertising division which has raised nearly two million for various charities around the country including, but not limited to: The Make A Wish Foundation, Boys and Girls Clubs, Ronald McDonald House, United Way, Red Socks Foundation, Cardinals Care, Special Olympics, 49ers Foundation, Kelly Cares Foundation, Detroit Tigers Foundation, Giants Community Fund, Community Foundation of Greater Memphis, LSU Foundation, UCONN Athletic Development Fund, Food for Lane County Oregon, and many many more. While Craig and Joy have spent over 21 years owning and managing Nikco Sports, agriculture has never been completely "out of the picture" and remains a passion and focus. Over the years Craig and Joy have remain intimately involved in agriculture and own and manage 9 farms located in McLean Co. Il., Piatt Co. Il., Champaign Co. Il., Douglas Co., Il., and St. Louis County, Missouri. We raise corn, soybeans, Longhorn cattle, Clydesdales, and two awesome and active children. The passion for Clydesdales began as a general fondness, appreciation, and admiration for these amazing horses. Once Craig and Joy purchased their future homestead off Wild Horse Creek Road it was just a matter of time before some sort of animal appeared to graze the beautiful valley pastures. 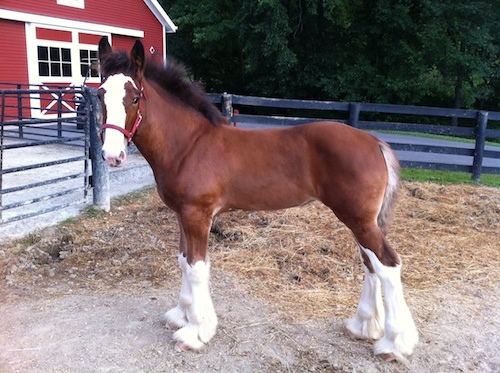 It ended up being a beautiful Clydesdale named Belleau W.S. 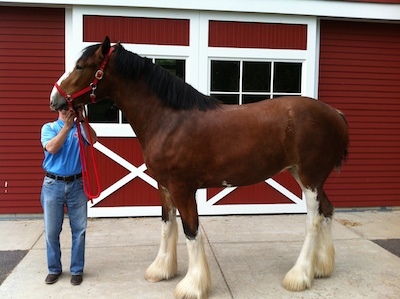 Serena purchased from Anheuser-Busch at the 2004 Clydesdale Breeders of the United States Sale in Springfield, Illinois. Below is a picture of Craig and Serena after the successful purchase on sale day. Craig and Joy purchased Gateway Dominator Design in 2012 and she is developing into a World Class 3-Year old mare. "Zoe", as she is nick-named, was sired by World Champion Stallion Deighton Dominator who was imported from Scotland. Below is a picture of Zoe as a 2 1/2 year old. Zoe just passed the 18 hands mark and as a 3 year old is still growing. Our current Clydesdale family would not be complete without Wild Horse Creek Piper Grace who was born to Serena on March 20, 2013. She just celebrated her first birthday and is fun to teach and train, if you have dealt with a 1,100 lb. 1 year old you know what I'm talking about. Piper Grace is a beautiful filly with a perfect bay color, white blaze, and four white stocking feet. We are looking forward to helping Piper Grace complete her full potential. Thanks for learning more about Wild Horse Creek Farms where we are passionate about breeding and raising World Class Clydesdales and Longhorn Cattle. Please drop us a line if you would like to learn more or have any questions by contact us at craigbidner@nikcosports.com.